The Chatham Anglers (9-8-2) will make their first trip to Eldredge Park of the summer to face the Orleans Firebirds (7-12-1) on Thursday. The two sides will face off for the second-straight day after Orleans’ 3-0 triumph at Veterans Field on Wednesday. 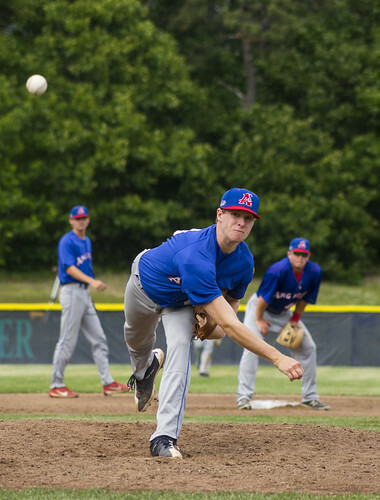 A day after posting 13 runs against Harwich, the Anglers suffered their first shutout of the season. After eight scoreless innings from pitchers Davis Daniel (Auburn) and Hunter Gaddis (Georgia State), the Firebirds broke the deadlock. Tristin English (Georgia Tech), making his first pitching appearance of the season, surrendered a leadoff double before Ben Ramirez’s (Southern California) throwing error put runners on the corners. David Daniel hasn't allowed a run in 11.2 innings of work this summer. English was relieved by Nick Scheidler (UCLA), who walked two batters and allowed all three runs. Chatham tallied just three hits on the night and was retired in order in all but one inning. The Firebirds achieved their second away win of the season, while the A’s fell for the fourth time in their last seven games. Two Chatham pitchers, Austin Bergner (North Carolina) and John McMillon (Texas Tech), will each make their season debut on the bump on Thursday. Bergner, a second-year Anglers player, tossed 36 strikeouts in as many innings of work in 2017. The right-hander registered a 1.16 ERA and was the winning pitcher in Chatham’s sole victory in the 2017 CCBL playoffs. During his spring season, Bergener amassed 82.2 innings of work along with seven wins. McMillon, a two-way player, made his first appearance as an A’s player in Tuesday’s win at Harwich, pinch-hitting in the ninth inning and striking out. The rising junior tallied a 4.02 ERA in his sophomore year at Texas Tech, nearly three points higher than his mark as a freshman (1.75). McMillon more than doubled his inning total from year one to year two, however, recording 62.2 frames of work. Orleans’ offense is led by JJ Bleday (Vanderbilt) and Pat Demarco (Vanderbilt), its one- and two-hitters. Of the Firebirds’ four hits in Wednesday’s win at Veterans Field, Bleday and Demarco accounted for half of them. Bleday’s leadoff double in the top of the ninth inning on Wednesday led to the breakthrough run in Orleans’ eventual 3-0 win. Bleday ranks third in the league with a .345 batting average and second in doubles with six. The Firebirds sit in fourth place in the East Division, three games back of the third place Anglers. Although Orleans sports a 7-12-1 record, its run differential is -7.